Anyone writing a blog post owes a debt to the “Father of History,” Herodotus. He was the first to show how write narrative history. And despite his additional appellation as the “Father of Lies,” he did show how to collect information systematically and to assess its validity. It’s noteworthy that his ἱστορία (historía, history), also means inquiry. The delivery channels have changed since the 5th century BCE, but we could still learn from his advocacy of careful methods. Herodotus lived in Halicarnassus, the site of the famous Mausoleum, one of the Seven Wonders of the World, as well as an ancient stadium and castle. 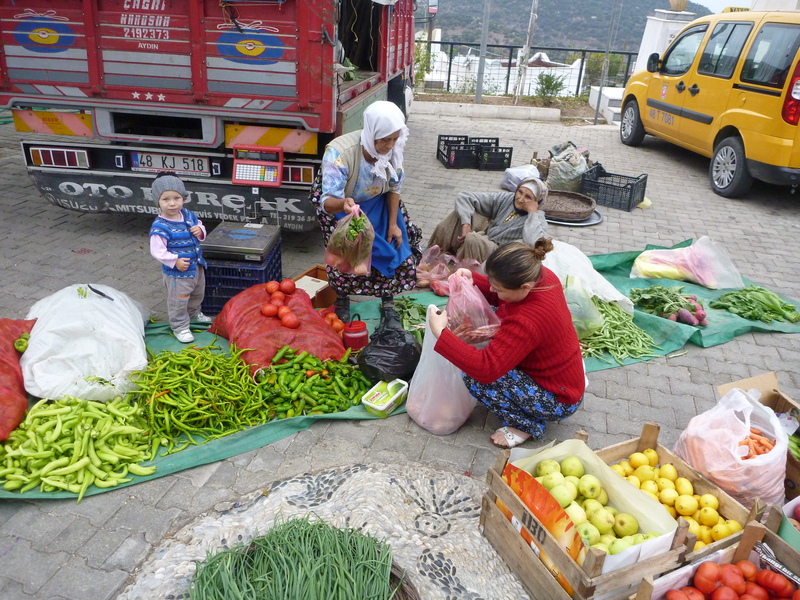 It’s now Bodrum, the booming town and resort area of southwestern Turkey. We’re staying not far from Halicarnassus/Bodrum, near Yalikavak. Of course much has changed. 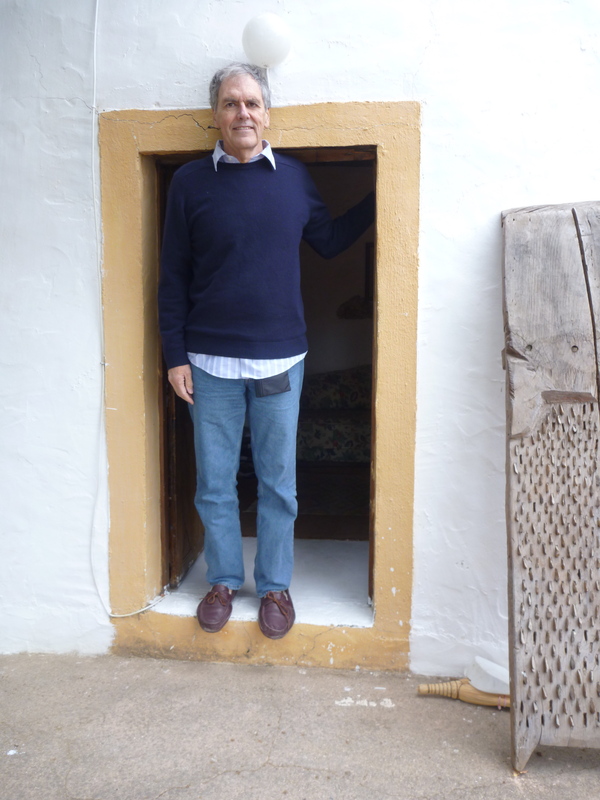 Our stone cottage has a smaller doorway than he would have wanted, or is it possible that people today are taller? There are still beautiful views of a landscape convoluted by millennia of volcanic activity and earthquakes, and of a limpid Aegean Sea. 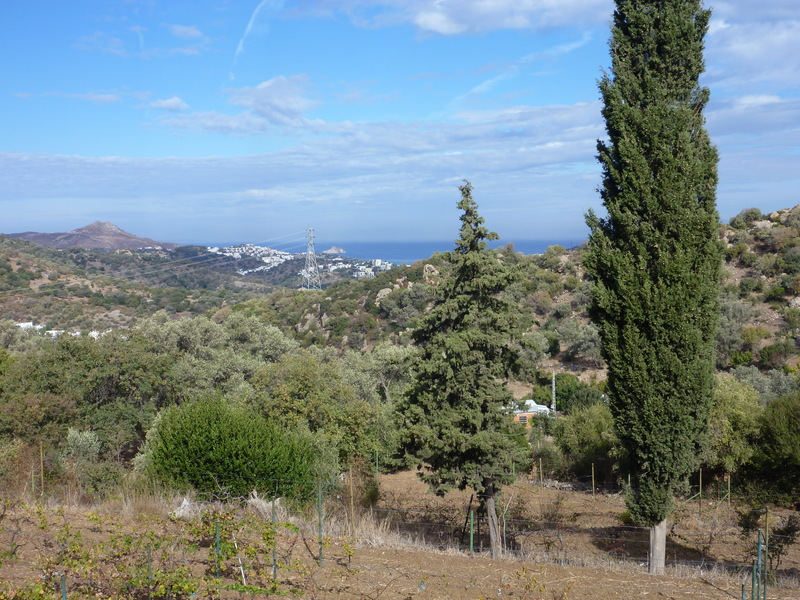 The vegetation is still of the maquis type, which is found throughout coastal regions in the Mediterranean–dense scrub, with evergreen shrubs, live oak, bay trees, olive trees, lavender, and rosemary. However, the hillsides are now coated with swaths of white block houses, reflecting the rapid development experienced here. 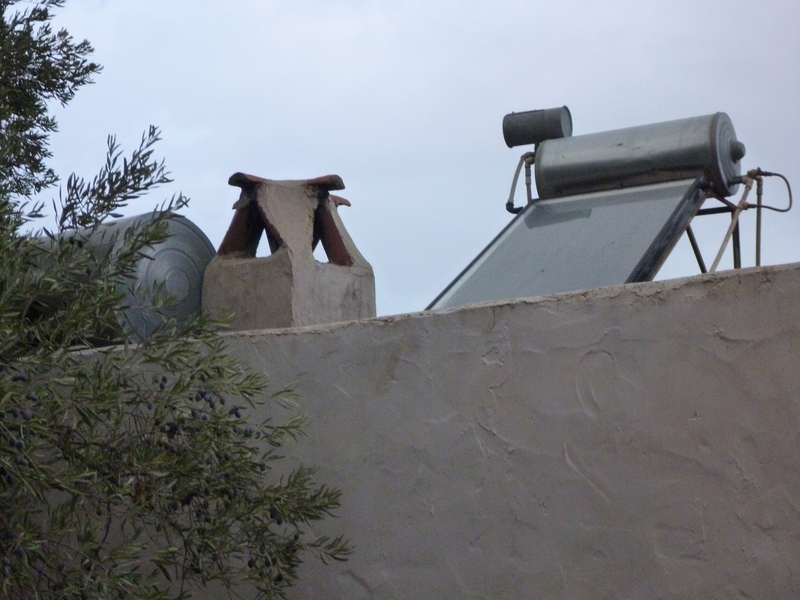 We have amphoras in our cottage, just as Herodotus must have had.They’re still made and used locally. 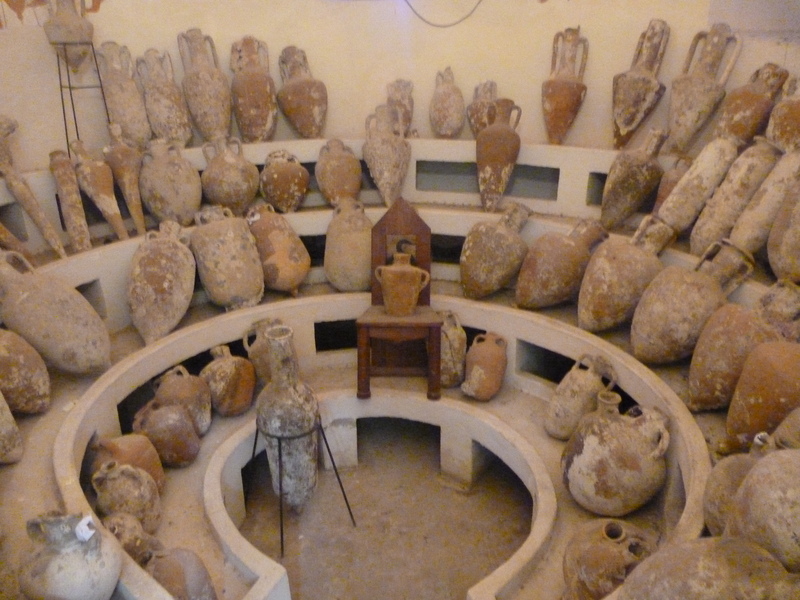 However, I’m not aware that the amphoras gather for symposia, as shown here in the Bodrum Kale (castle). That exhibit is part of the underwater archaeology museum, the world’s largest. 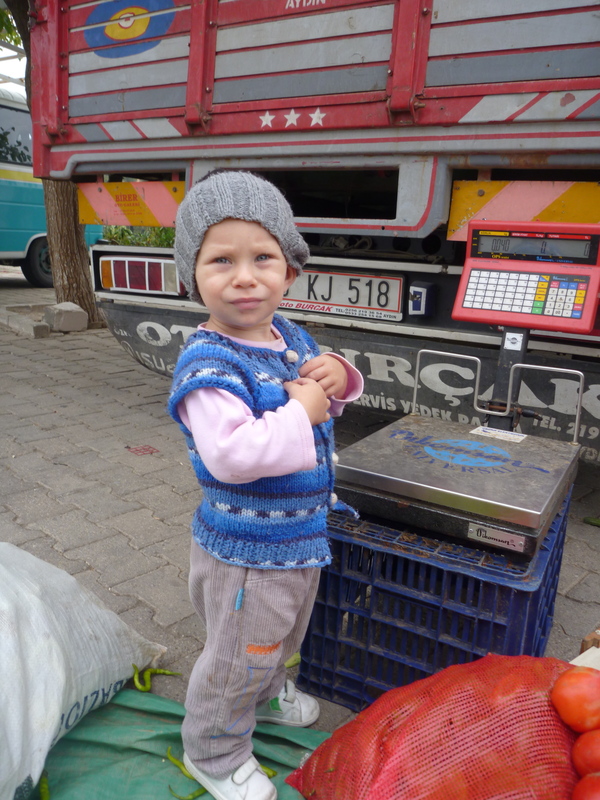 At the end of the day yesterday, we stopped to buy some vegetables for dinner. Although Herodotus wouldn’t have used the Turkish lirasi as we do, it’s not hard to envision him or someone in his household selecting beans, carrots, or onions as we did. Even the measuring device would have been similar, a crude balance with old, battered weights. 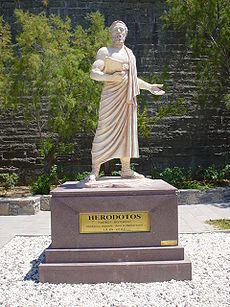 I’d always imagined Herodotus as an old man with a long white beard, as he’s portrayed in statues. But thinking of his life here, I now wonder: Would a young Herodotus be writing blog posts from his stone cottage? And when he was younger still, how much would he look like the young boy we see today? I had shoulder surgery on August 18, so my days of paddling through rapids or hoisting a canoe on my shoulders need to be postponed. As a substitute, I’ve been reading A thousand miles in the Rob Roy canoe on rivers and lakes of Europe (1866), by John Macgregor (1825-1892). MacGregor himself led a life that sounds like an overdone adventure yarn. At the age of three months, he was rescued from a burning ship whil een route to India with his parents. At the age of 12, he helped launch a rescue boat for a ship in distress off Belfast, then slipped aboard secretly a the last moment to help out. He grew up sailing, boat-building, riding, reading, and experimenting with home-made steam engines, batteries, and chemicals that led to several major explosions. He attended seven schools before graduating from Trinity College, Dublin in mathematics. He traveled throughout the world, fighting Greek pirates and crocodiles, climbing Mont Blanc, Etna, and Vesuvius. He won awards for sharpshooting, drew for Punch and illustrated books, and wrote his own books on marine propulsion, patent law, travel, and transcriptions of Syrian and Egyptian melodies he had heard in his travels. MacGregor built a hybrid canoe / kayak with a sail and a double-bladed, kayak paddle which he named the “Rob Roy”. He then paddled through the rivers, lakes and canals of Germany, France and Switzerland, portaging between waterways on a cart or on trains. His account of the journey became a best seller and was the beginning of the recreational canoeing movement. His trip inspired many, including Robert Louis Stevenson, who made his own voyage in a Rob Roy, and then wrote about it in his first published book, An inland voyage. MacGregor’s account portrays a Europe with only distant resonance to today. Instead of shopping centers and freeways, there were people cutting hay with hand tools. Instead of the Web, there were newspapers, 3241 in Germany alone. Something like it is felt when you first march off with a knapsack ready to walk anywhere, or when you start alone in a sailing-boat for a long cruise. While working at the National College of Ireland, I got into a lunchtime discussion about driving, in particular, about why some countries, such as Ireland, drive on the left and others, such as the US, drive on the right. None of us could even say with much certainty how many people in the world did it one way or the other. Seemingly simple questions led to many jokes, confident pronouncements, and further questions about changeovers, what boats and planes do, and so on. The side of the road one drives on seems to be one of those mundane details of everyday life which people take for granted and never bother to write down. In his book, Kincaid comes up with a blank: “I have been unable to discover any firm evidence as to what the rule of the road was in any part of the ancient civilizations in Greece, Rome, or Assyria. It seems inconceivable that there was not one.” We have found, however, evidence that the ancient Romans drove on the left. Another piece of evidence comes from a Roman coin. Robert Pease writes that he has seen a picture of a denarius from between 50 BC and 50 AD showing two horsemen riding past each other, right shoulder to right shoulder (i.e. each keeping to the left side of the road). It was amazing to me to learn how this simple practice connects with our physical characteristics, modes of transportation, revolution and empire, warfare, commerce, and many other aspects of daily life. I’m now completing a wonderful, two-week trip to Turkey and Cyprus. Unfortunately, the return journey isn’t uniformly wonderful. I arrived in Athens, from Larnaca, Cyprus, following a drive from Limassol to Larnaca. I’d been up since 3 am and it was now 9 am. I anticipated a 4-hour layover, with nothing much to report. But a delay on the Athens-Philadelphia segment turns that into a 10-hour layover, which causes me to miss the flight to Indianapolis. USAir has booked me for a 10:30 am flight from Philadephia tomorrow. This means the 27-hour travel time I had braced myself for is turning into 44 hours, assuming that everything from here on goes well. I considered going into Athens for the day, but between the lack of sleep and my carry-on stuff, I decided to stay at the airport. Unfortunately, it’s hot and humid, so walking around isn’t a great option. Moreover, it’s very crowded and there are no places left to sit. I’m sitting on the floor at this moment, both to get away from all the smoke and to take advantage of one of the few electrical outlets. People walking by give me amused looks, undoubtedly out of jealousy for the great spot I found. They know that the hard floor is still much better than the cramped seating that USAir offers on its 11-hour flight. All in all, the situation offers an ideal opportunity to be annoyed. 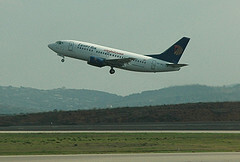 (Photo shows some plane actually taking off from Venizelos airport&mdash:it’s not my plane, which is lost somewhere). It’s probably an indication of fatigue and sleep deprivation that I’ve begun noticing odd connections. My flight is marked as Νέα, which I think is short for “nea hora” or new hour/time. Upstairs the Νέο McCafe offers surprisingly the most attractive option for sitting. And then I discovered a new Airport Museum, which helped me forget the travel vagaries. It chronicles the history of the Spata area, where the airport is built. Things To Do [when your plane is delayed six hours]: Visit the airport mini museum. Athens International Airport “Airport Museum” presents the continuity of life in the rural Messogia plains and its evolution through 172 archaeological findings discovered in the excavations undertaken during airport construction, and dating from the Neolithic and Early Helladic through the Post-Byzantine period. I’m using Otenet, which claims to offer many Νέο features. So I feel I’m being immersed in neo/nea-ness, even though I’m not sure I understand exactly what’s new and what’s late, other than my plane. I also discovered a separate exhibit on Eleftherios Venizelos, for whom the airport is named. He was a prominent statesman of the early 20th century, who helped to create the Νέο Greece we know today. What’s interesting today is that many abroad would also identify with Mr. Smith. And they admire the US for modeling his values, offering hope for other countries. They recall our promotion of the Kellogg-Briand pact, the struggle against authoritarian regimes, the Nuremburg trials, the United Nations, the Geneva Conventions, as concrete examples of how we have stood for truth, peace, courage, and justice, just as Mr. Smith might have wanted. Their values are our values; their people are our people. No book or map is a substitute for personal experience; they cannot take the place of the actual journey. The mathematical formula for a falling body does not take the place of throwing stones or shaking apples from a tree. There are some who say that sitting at home reading is the equivalent of travel, because the experiences described in the book are more or less the same as the experiences one might have on a voyage, and there are those who say that there is no substitue for venturing out in the world. My own opinion is that it is best to travel extensively but to read the entire time, hardly glancing up to look out of the window of the airplane, train, or hired camel.